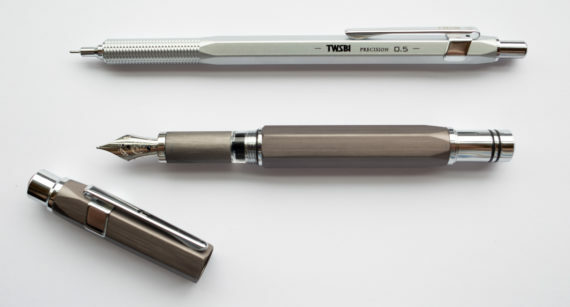 As part of my search for the perfect sliding sleeve pencil, I nearly bought a TWSBI Precision in 2015. I say nearly because after talking to Philip Wang1 I found out that the sleeve is not designed to slide back while you are writing – so I didn’t go ahead with the purchase. This Summer, three years later, I had a chance to try out Scribble‘s Precision. 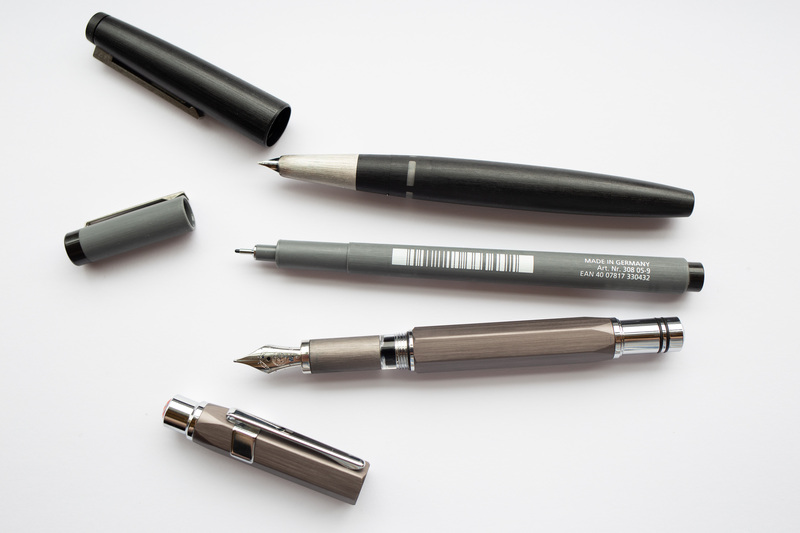 He lent his Precision mechanical pencil and fountain pen to a few bloggers for an upcoming United Inkdom meta-review. I’ll skip introducing TWSBI here, as by now there is quite a good article about TWSBI on Stationery.wiki. I assume it’s only a matter of time before someone will copy this article into Wikipedia, thanks to Stationery.wiki’s Creative Commons license. 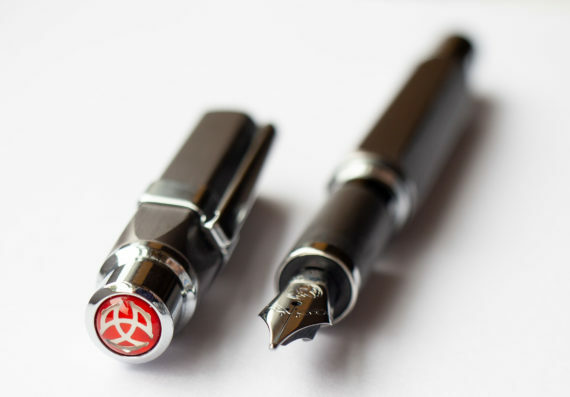 Wikipedia has deleted stationery articles in the past, with the argument that the brands, products or people or not ‘notable’ enough, but maybe TWSBI is big enough by now. If not then there is always Stationery.wiki, which is better suited to geek out about stationery. Let’s talk about the fountain pen first.2 Both are called ‘Precision. Seeing the mechanical pencil and fountain pen together I get that there is a resemblance between both (hexagonal body, round grip section, Caran d’Ache style clip), but it is not very strong (certainly not as strong as with Rotring pens of the same series) and in my opinion they could be part of a different series and didn’t need to have the same name. 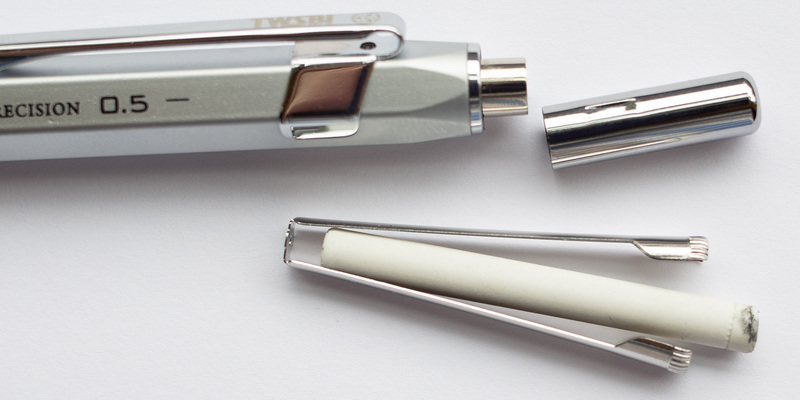 That said, Precision is a nice name which does represent TWSBI’s expertise. I have quite a few piston fillers, but I think none of the others has such a small ink window. When filling the pen I couldn’t really see the piston. Somehow the whole mechanism feels very much buried deep in the pen and I didn’t get an intuitive feeling how much ink capacity there is or how much ink there might be left in the pen. On a positive note, I did like the surface of the pen very much. It reminds me of the surface of the Lamy 2000 or Staedtler’s Pigment Liner. Of all the TWSBI fountain pens I have used or that I own this one is my least favourite. It is a nice pen, but the design just doesn’t work for me. If you like the look of this pen then it might be the right one for you though. As is common with TWSBI you get good quality and a few extras for your money. When I first got the Precision mechanical pencil I didn’t like the look very much. That was then. Over time it really grew on me. By the time I had to send it back to Scribble I was very keen on the looks and on the pencil as a whole. If it wasn’t for the issues I will mention later I would probably order my own TWSBI Precision now. How does this pencil compare to others on the market? To me, it’s similar to a Rotring with some Caran d’Ache mixed in. In my video about this pencil, you’ll see that the clip of the Precision is so similar to a Caran d’Ache that it’s virtually impossible for this similarity to be a coincidence (Jump to 1:05 in the video to see the different clips side by side). Some shops referred to a version 1 and version 2 of this pencil. I was not able to find out what version 1 was. It might be a reference to the TWSBI Precision X, I am not sure. It looks as if the Precision X didn’t make it past the prototype stage. 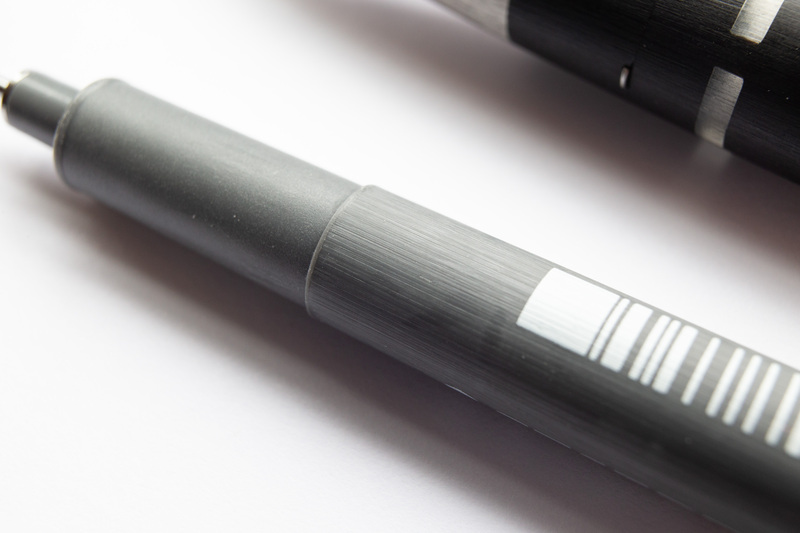 It is somehow similar to the Rotring Rapid, which has been discontinued (not to be confused with the Rapid Pro), but is still available online as new old stock. Colour-wise current Precision was available in silver and black, but in 2018 only the silver version is available. This has also been confirmed by TWSBI’s Philip Wang. Tip-wise there is a retractable and a fixed version and diameter-wise there is an 0.5 mm and an 0.7 mm version. As a metal pencil, the Precision is of course on the heavy side. It weighs 25 g. The knurled grip is quite nice, at least in my opinion. 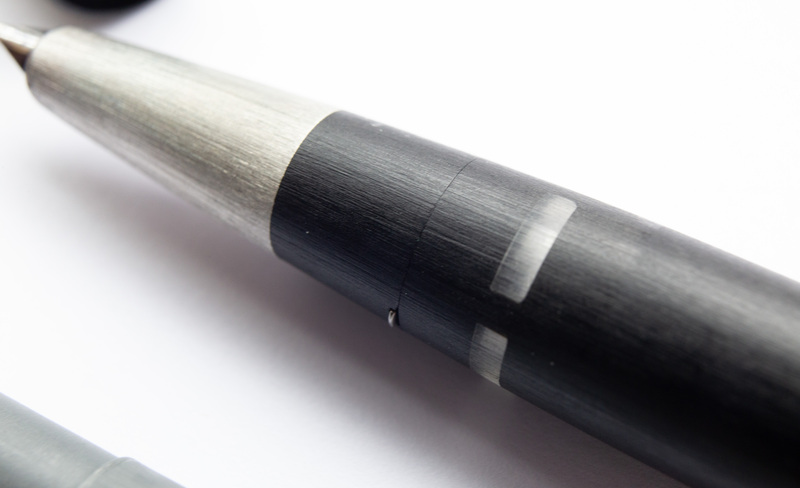 the knurling is not as fine as on a Rotring which means little bits of dust and dirt don’t stick as much to the grip section. 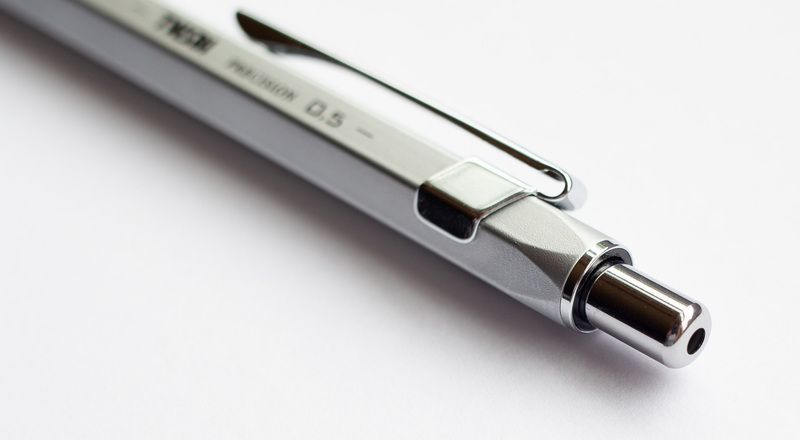 Most mechanical pencils have quite short erasers. There are of course exceptions to this rule, like the Faber-Castell Executive, the Vario L or some of their Grip pencils. Well, you can add the Precision to this list of exceptions. The Precision pencil even comes with replacement erasers. Let’s get to the point where I discuss my issues with this pencil. I am still not sure whether my two issues do occur with all Precisions or whether it’s just something the one Precision I had on loan suffered from. ..but fear not! Dave of Dave’s Mechanical Pencils fame said he will have a look at his pencil, so with some luck, you can expect an update here or on his blog. There is also a planned meta-review of the Precision on United Inkdom and I am hoping one of the other reviewers will pick up in the following two points. a) I had a lot of lead breakage with this pen. Lead breakage that occurred within the Precision that is, i.e. I want to advance the lead, but notice it is broken. This could be down to the fact the lead that was in the pencil when I got it was very soft. It could also have happened during transport, i.e. the lead was already damaged. It could also be linked to my next point. b) I haven’t used another pencil with that much lead advance. More than 2 mm per click. 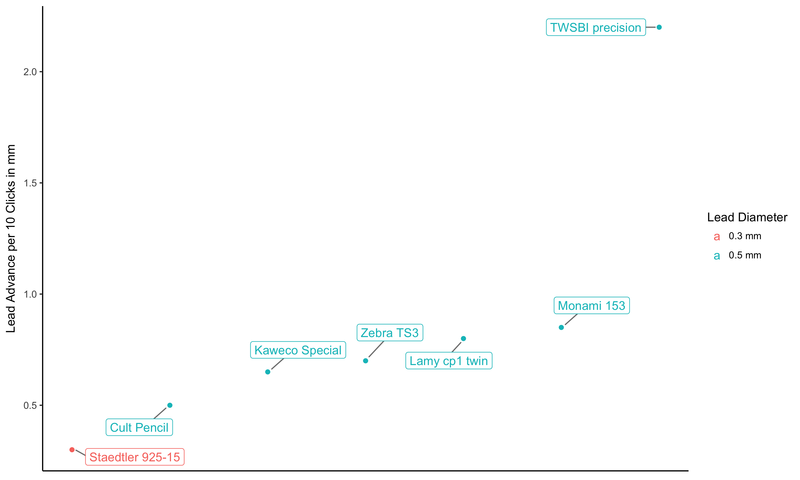 Compared to other pencils I reviewed as part of my Pencil Videos series it is off the charts (not literally as I can just change the y axis 😜 and it is not off the charts anymore) – have a look. 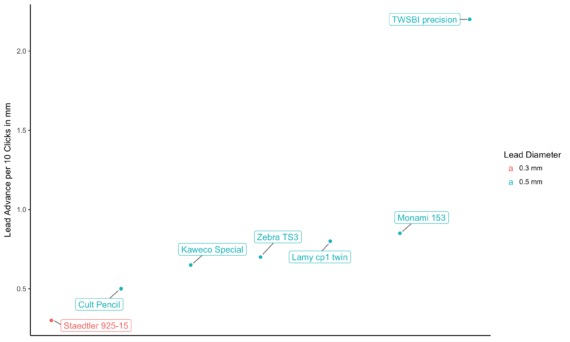 When I contacted TWSBI’s Philip Wang I didn’t get a clear answer how many mm the lead should advance per click (the answer was basically “that’s a very strange thing to ask”), so I hope Dave will be able to tell me more. Ian reviewed the exact pencil I had in my hands and he reported that the lead advances 1.5 mm per click. My measurement was nearly 50% bigger. Maybe there is something wrong with this specific pencil and the advance shouldn’t be that much? Less from the Comfortable Shoes Studio and the RSVP podcast owns the retractable 0.7 mm version. I contacted her and she reports that her pencil gives 1.5 mm of lead at the first click, the next 0.5 mm, then 1 mm and after that it’s always 1 mm or 0.5 mm. Dave from Dave’s Mechanical Pencils left a comment under this blog post reporting that he also has the retractable 0.7 m version, like Less. He reports that ’10 clicks advance 7.5mm of lead, and I think they are all even, so that’s 0.75mm per click, a relatively normal amount’. I assume Dave’s Precision works as intended, Less and the one I borrowed from Scribble don’t. I am not sure whether this indicates that the Precision is more prone to ‘lead advance issues’ as we don’t know whether Less’s and Scribble’s pencils weren’t ‘mistreated’, e.g. by the postal service. Why is the increased lead advance an issue? The more the lead is extended, the more likely it will break (breaking outside the pencil, as opposed to inside the pencil). 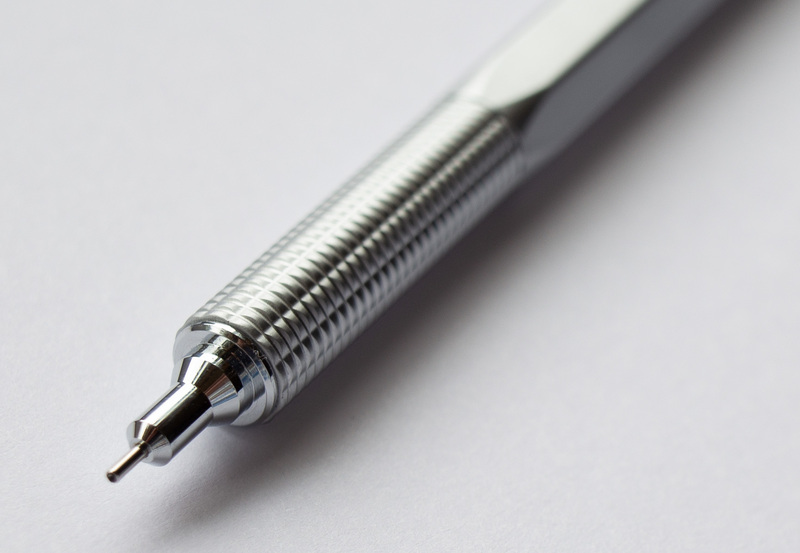 More nominal (and also axial) pen force (explained in this old blog post) or a more acute your writing angle will make your lead more likely to break. If you hold your pen vertically it could of course also break because of the pen force. A discussion about a potential link between lead advance and sliding sleeve can be found in the comments to this blog post. Overall this is a great pencil. I like the long eraser, I (now) like the looks, I just wish the lead advance would be more in line with other pencils out there. I would like to thank Scribble for lending me his Precision pens.